Several Gibraltar-based insurers still face considerable hurdles to beef up their capital ahead of the implementation of Solvency II, according to an investigation by GR’s sister title Insurance Times. Motor insurer Octagon is the hardest hit of the insurers studied, having slipped below its minimum solvency requirement in 2013, according to regulatory filings. The car and van insurer is also seeking additional capital from its shareholders, according to latest filed accounts. In another development, two sources told Insurance Times the company was looking for buyers, although Octagon could not be contacted for comment. The study also found that two other insurers, Southern Rock and Enterprise, have slipped below the minimum margin required over the past two years. Solvency II capital rules will come into force in Gibraltar at the start of 2016. Those companies that cannot keep up with the tougher capital requirements of the European regulation will face the stark choice of selling up, converting to a managing general agent (MGA) or closing their doors, according to sources. Gibraltar’s current rules are based on Solvency I, which calculates capital requirements based on an insurer’s premium income or claims reserves. It is considered lighter than some other standards regimes, such as the UK’s present Individual Capital Adequacy Standards rulebook, which is more risk-based. Gibraltar is hoping, however, that adoption of Solvency II will change this perception. The Gibraltar regulator – the Financial Services Commission (FSC) – is pushing companies to have a solvency margin of 150% in the run-up to Solvency II. By the time Solvency II comes into force across Europe in 2016, it wants all the Gibraltar regulated firms to have a 200% margin. FSC Solvency II programme director Ken Hogg says he is prepared for the prospect of some firms deciding instead to “call it a day”. Out of the four firms studied, Octagon has the most challenges. The firm, formed in 2009, was £507,000 below the £8.2m minimum solvency margin the FSC required of it at the end of 2013, according to filings with the regulator. This gives it a solvency margin of 93.8%. Its situation has deteriorated since 2012 when it had a £3.7m surplus over the minimum requirement, giving it a solvency margin of almost 152%. It is unclear whether Octagon has been able to negotiate a capital increase with its shareholders. Insurance Times’ calls and emails to managing director Chris Hill were not returned. Octagon is not alone. 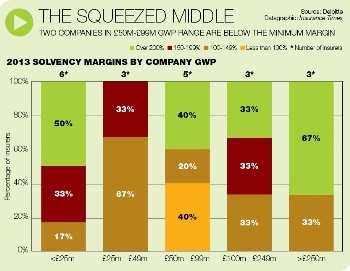 Deloitte’s annual review of Gibraltar insurers shows that two companies in the £50m to £99m gross written premium range were trading below their minimum solvency margins at the end of 2013 (see chart). Also, other companies have wrestled with fluctuating solvency positions. Enterprise had a £1m deficit to its solvency margin as of 31 March 2012, according to its accounts. This had improved to a small surplus of £100,000 as of 31 March 2013. After that date, the company’s parent injected £14.7m and it raised a further £8m from other shareholders. The company says if this had been in place as of 31 March 2013, its solvency margin would have been 153%. But Enterprise’s regulatory filings show that at 31 March 2014, the solvency margin was just 112.1%. Enterprise managing director Andrew Flowers says that the reduction came about because “we were the subject of an actuarial valuation that effectively meant we put some more money into our reserves based on the immaturity of our book”. Another company that recently fell below its minimum solvency requirement was Southern Rock. At the end of 2012 its capital fell £11.7m short of its minimum requirement of £18.1m, giving it a solvency margin of 35.5%. The company says in its accounts that this was caused by the regulator not allowing £8.3m of deferred processing costs to be counted as assets and also excluding a further £4.8m of assets because it deemed the insurer to have an over-exposure to a third party. The company also did not receive £4m of dividends it was expecting until the following financial year. Southern Rock says that the situation has been addressed and regulatory filings show its solvency margin had increased to 129% in 2013. The heads of Enterprise and Southern Rock both say their solvency levels are where they need to be. He added that it was “a dangerous exercise” looking at solvency levels in isolation because there are several reasons why an insurer may dip below its requirement in any given year. Southern Rock chief executive Chris Gillighan says: “A combination of consistent loss ratios and reinsurance arrangements positively impacting our required minimum margin has left us with end of September solvency of 142%. Commercial motor insurer Tradewise’s 2013 solvency margin of 145.9% was just shy of the FSC’s interim target of 150%. But chief executive James Humphreys says the firm’s current margin is 156% – and increasing. “Like the rest of the market we have consistently increased prices for the last three years and significantly improved the risk profile of the business,” he says. Companies that are unable to raise capital and hit required margins face a difficult choice. The simplest would be to either find a buyer or close. The FSC is braced for firms leaving the market. Hogg says: “There will inevitably be some firms that decide, for whatever reason, to call it a day. That’s fine. We will make sure there is an orderly run-off. Another option is to convert to an MGA to avoid having to hold solvency capital. Deloitte’s annual review of the country’s motor insurance market shows that at year-end 2013, eight of the 20 companies it studied had solvency margins above 200%, up from five in 2012 and just one in 2010. The trajectory may be positive, but whether it will see all Gibraltar insurers home and dry for Solvency II remains in doubt. What should insurers be preparing for?